Gonnardite: Mineral information, data and localities. For French mineralogist Ferdinand Gonnard (1833-1923). 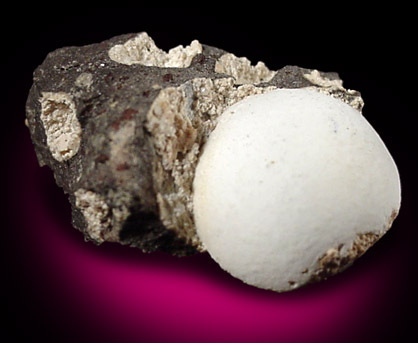 Most gonnardites have a disordered natrolite framework. The compositions of and structural relationships between gonnardite and tetranatrolite remain controversial (Artioli and Galli 1999; Evans et al. 2000; Ross et al. 1992; Lee et al. 2006). Also space group I-42d, a = 13.21(1), c = 6.622(4) A.
Calcite 49 photos of Gonnardite associated with Calcite on mindat.org. Natrolite 43 photos of Gonnardite associated with Natrolite on mindat.org. Haüyne 29 photos of Gonnardite associated with Haüyne on mindat.org. Analcime 28 photos of Gonnardite associated with Analcime on mindat.org. Pyrite 17 photos of Gonnardite associated with Pyrite on mindat.org. Phillipsite 17 photos of Gonnardite associated with Phillipsite on mindat.org. Phillipsite-Ca 15 photos of Gonnardite associated with Phillipsite-Ca on mindat.org. Phlogopite 13 photos of Gonnardite associated with Phlogopite on mindat.org. Rhodochrosite 10 photos of Gonnardite associated with Rhodochrosite on mindat.org. Thomsonite-Ca 10 photos of Gonnardite associated with Thomsonite-Ca on mindat.org. Mazzi, F., A.O. Larsen, G. Gottardi, and E. Galli (1986) Gonnardite has the tetrahedral framework of natrolite: experimental proof with a sample from Norway. Neues Jahrb. Mineral., Monatsh., 219-228. Nawaz, R. (1988) Gonnardite and disordered natrolite-group minerals: their distinction and relations with mesolite, natrolite and thomsonite. Mineral. Mag., 52, 207-219. Mineralogical Magazine (1998): 62: 548. Artioli, G. and Galli, E. (1999) Gonnardite: Re-examination of holotype material and discreditation of tetranatrolite. American Mineralogist 84, 1445-1450. Evans, H.T., Konnert, J.A., and Ross, M. (2000) The crystal structure of tetranatrolite from Mont Saint-Hilaire, Quebec, and its chemical and structural relationship to paranatrolite and gonnardite. American Mineralogist 85, 1808-1815. Kol’tsova, T. N. (2005) Zeolites of the natrolite-thomsonite series. Inorganic Materials, 41, 750-756. Lee, Yongjae, Hriljac, Joseph A., Parise, John B., and Vogt, Thomas (2006) Pressure-induced hydration in zeolite tetranatrolite. American Mineralogist 91, 247-251. The following Gonnardite specimens are currently listed for sale on minfind.com. Postl, W. (1987); Postl, W., Taucher, J. & Moser, B. (1996): Neue Mineralfunde im oststeirischen Vulkangebiet. Mitt. Abt. Miner. Landesmuseum Joanneum, 60/61, 3-76. Visual ID by Laszlo Horvath. Atencio et al. (1999) Canadian Mineralogist 37, 91-98. Van Velthuizen, J.J., Gault, R.A., Robinson, G.W. & Scovil, J. (2006), Zeolite occurrences in the Central Metasedimentary Belt of the Grenville Province, Ontario, Quebec and New York State. Mineralogical Record: 37: 283-296 [locality #83]. Pauliš, P.: Nejzajímavější mineralogická naleziště Čech. Kutná Hora: Kuttna, 2000, s. 84-85. Sejkora J., Jebavá I., Plášil J., Bureš B., Tvrdý J.: Nordstrandit z lomu v Děpoltovicích u Karlových Varů (Česká republika). Bulletin mineralogicko-petrografického oddělení Národního muzea v Praze, 2010, roč. 18, č. 1, s. 33-41. Rychlý, R.: Gonnardit z lokality Horní Hrad, sv. od Ostrova nad Ohří. Časopis pro mineralogii a geologii, 1980, roč. 25, č. 3, s. 319. Černý, P. et al. : Mokrá u Žlutic, lokalita gibbsitu, böhmit a zeolitů. Minerál, 2002, roč. 10, č. 6, s. 403 - 408. Petersen Ole V.,Secher K.(1985) - Gronland: Mineralien, Geologie, Geschichte. - Verlag Bode & Partner K.G., Bochum, 87 pagg. Keck, E. (2008): Der Wartberg bei Längenau, nordöstlich von Selb, in Oberfranken. Aufschluss 59, 109-128. Blaß, G. and Graf, H.W. (1994) Neufunde von bekannten Fundorten (X), Mineralien-Welt, 2/1994. ; Blaß, G. and Kruijen, F. (2015) Neuigkeiten aus der Vulkaneifel (II/2015). Mineralien-Welt, 26(5), 80-90. G. Artioli et al. , Am. Min. , V84, 1999, pp. 1445-1450. Szakáll & Jánosi: Minerals of Hungary, 1995; Kónya, P. and Szakáll, S. (2011): Occurrence, composition and paragenesis of the zeolites and associated minerals in the alkaline basalt of a maar-type volcano at Haláp Hill, Balaton Highland, Hungary. Mineralogical Magazine 75, 2869-2885. 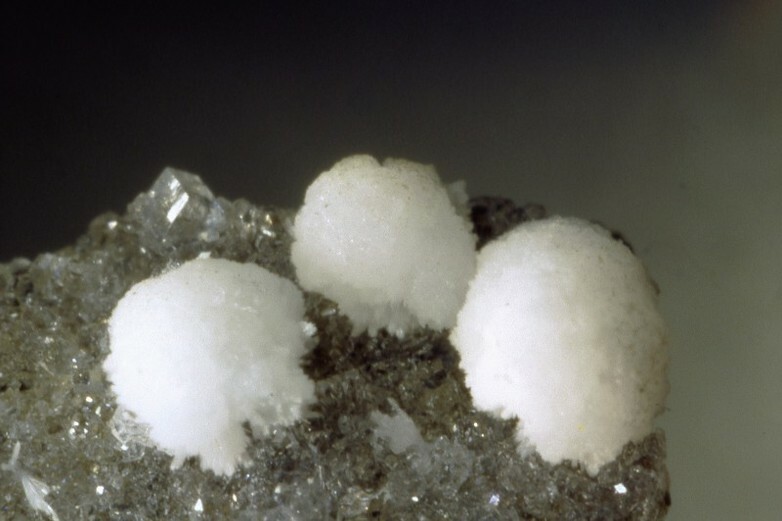 Gelosa, M. & Mameli, P. (1999): I minerali delle cave di Osilo: località mineralogiche della Sardegna. Rivista Mineralogica Italiana, 2/1999, 92-96. Daleffe, A., Boscardin, M. & Rocchetti, I (2012): Garronite e Gonnardite del Colle di San Valentino, Salcedo, Vicenza . Nishido et al (1990) Sanko-Gakkai Kou'en-Youshi, 52. Paolo Forti - Genetic processes of cave minerals in volcanic environments: An overview. Journal of Cave and Karst Studies, v. 67, no. 1, p. 3-13. Nordrum, F. S. (2007): Nyfunn av mineraler i Norge 2006-2007. STEIN 34 (2), 14-26; Svein A. Berge collection/observation 1993. Dudkin, O.B., Minakov, F.V., Kravchenko, M.P., Kravchenko, E.V., Kulakov, A.N., Polezhaeva, L.I., Pripachkin, V.A., Pushkarev; A.N., Ryungenen; G.I. [Дудкин, О.Б., Минаков, Ф.В., Кравченко, М.П., Кравченко, Э.В., Кулаков, А.Н., Полежаева, Л.И., Припачкин, В.А., Пушкарев, Ю.Д., Рюнгенен, Г.И.] (1984): Carbonatite of Khibiny [Карбонатиты Хибин]. Kola Branch, USSR Academy of Science Press [Издательство Кольского филиала АН СССР], Apatity, 97 pp. (in Russian); Zaitsev, A.N., Men'shikov, Yu.P., Yakovenchuk, V.N. [Зайцев, А.Н., Меньшиков, Ю.П., Яковенчук, В.Н.] (1992): Barium zeolites of the Khibiny alkaline massif [Бариевые цеолиты Хибинского щелочного массива]. Zapiski Vserossiiskogo Mineralogicheskogo Obshchestva [Записки Всероссийского Минералогического Общества], 121, 2, 54-61 (in Russian); Yakovenchuk, V.N., Ivanyuk, G.Yu., Pakhomovsky, Ya.A., Men'shikov, Yu.P. (2005): Khibiny. Laplandia Minerals Ltd. (in association with the Mineralogical Society of Great Britain and Ireland), Apatity, 468 pp. Stalder, H. A., Wagner, A., Graeser, S. and Stuker, P. (1998): "Mineralienlexikon der Schweiz", Wepf (Basel), p. 194. Alan F. Cooper, Durmus Boztuğ, J. Michael Palin, Candace E. Martin, Mihoko Numata (2011) Petrology and petrogenesis of carbonatitic rocks in syenites from central Anatolia, Turkey. Contrib Mineral Petrol 161:811–828. Foy, H. (1994). 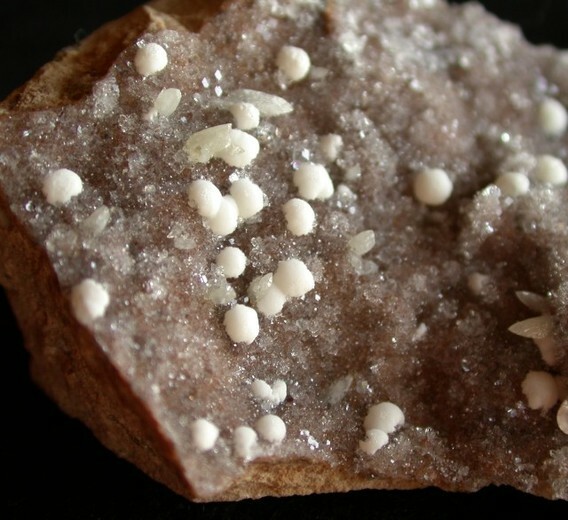 Gobbinsite from Magheramorne Quarry, Northern Ireland. Mineralogical Magazine, 58, 615-620. Anthony, J.W., et al (1995), Mineralogy of Arizona, 3rd.ed. : 237. Pemberton, H. Earl (1983), Minerals of California; Van Nostrand Reinholt Press: 373.